Aware that “the Judeans sought to kill him” (7:1) Jesus nevertheless makes his way into the lions’ den of Jerusalem. There a contingent of Pharisees and scribes zealously await him like prowling lions ready to devour (1 Pet 5:8). In Jerusalem Jesus’ presence once again rouses the city, so that John writes, “a division among the people” ensued (7:43). One day the Pharisees and scribes intent on finding fault with Jesus so “that they might have some charge to bring against him” (8:6), barrage Jesus while he is teaching near the temple, dragging in their trail a woman just caught in the act of adultery. They salivate with glee at this woman’s wretched state, an opportunity to get him! “Teacher,” they almost mockingly say—‘Rabbi’—“this woman has been caught in the act of adultery. Now in the law Moses commanded us that such are to be stoned. What do you say?” (8:5). They know full well that if Jesus says “Stone her,” they can run to the Roman authorities and have Him condemned for breaking Roman law, but if He lets her go they can condemn him for breaking the Mosaic law, and can stone Him too, or at least arrest Him to be executed later. Jesus eludes their trap. He says nothing. While the mob stands around him He calmly remains seated, bends down and writes in the ground with His finger. What exactly did He write? What words, letters? Scripture doesn’t say, and Tradition is undecided. Yet it is the action of writing itself which retains importance. John’s chronological style manifest in the narrative leading up to this account makes it very likely that this whole scenario occurred on ‘the eighth day’ called Shemini Atzeret (Lev 23:36,39) which came after “the last day of the [Jewish] feast” of Sukkot (7:37). This ‘eighth day’ was a holy day of rest governed by laws akin to the Sabbath. It is written in the Mishna—believed to be a record of Pharisaic oral teachings that informed Jewish practice during the Second Temple period (536 BC – 70 AD), when Jesus lived—that writing even two letters in any durable form was unlawful on the Sabbath (M. Shabbat 7:2), but that if one wrote “with any substance which does not endure,” such as by writing “in the dust of the road… he is exempt” (12:5). As a day of rest the ‘eighth day’ after Sukkot would also fall under this ruling. Jesus’ writing in the sand thus manifests His knowledge and mastery of the Mosaic law and oral tradition, pointing to His righteousness and spiritual authority. Furthermore, the Mosaic covenant and law was encapsulated by the ten commandments which were “written with the finger of God” (Ex 31:18), and by using His finger to write Jesus discreetly shows Himself to be the New Moses, Man and God, who has come to “make a new covenant,” and to write the law of grace upon our hearts (Jer 31:31-33; Rom 8:2). By writing in the ground Jesus thus identifies Himself as the one prophesied by the first Moses through whom God said: “I will raise up for them a prophet like you… and I will put my words in his mouth, and he shall speak to them all that I command him” (Deut 18:18). Jesus confirmed this when He said to the Judeans, “If you believed in Moses, you would believe in me, since he wrote concerning me” (Jn 5:46). After writing on the ground Jesus stands up. He is now going to exercise His authority as the New Moses and Son of God to whom “all judgment has been committed” (5:22), and so He speaks the words His Father has “put… into his mouth”: “Let he who is sinless among you be the first to cast a stone at her” (8:7). Jesus doesn’t deny the law as though the sin was harmless or the penalty unfitting—and so He upholds justice. Yet nor does Jesus enforce the law, exacting its full weight upon the woman—and so He upholds mercy. 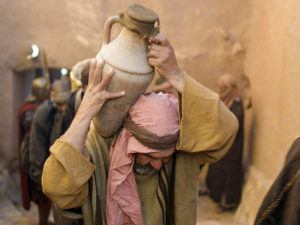 Jesus takes the ‘stone tablets’ of the law which the pharisees and scribes are seeking to smash the sinful woman with and opens their eyes to see that being sinners themselves, true and radical justice would have them join the woman in being stoned—since all sin is held in Scripture as figurative adultery against God (Ez 16). By speaking thus, “Let he who is sinless among you…” Jesus highlights that the purpose of God’s law given to Moses was never justice, because if it was, in the words of the Psalmist, “If you, O Lord, should mark iniquities… who could stand?” (Ps 130:3). Sure, the law involved some justice, but even God’s relative leniencies in the law whereby stones weren’t raining down from heaven upon every sinner highlights God’s preference for mercy over justice. “For I desire mercy” says the Lord (Hos 6:6). Hence Jesus who was teaching the crowd before the mob came, continues His office as teacher in the line of Moses. ; and by saying, “Let he who is sinless among you be the first to cast a stone,” He reveals that the law is not fulfilled by carrying out its “old written code” in justice but by living out its Spirit, the Spirit of Mercy (Rom 7:6). God temporarily permitted the law to be lived according to the letter because “if it had not been for the law,” as Paul says, “I should not have known sin” but once sin was “shown to be sin” (Rom 7:7,13) God sent “His own Son in the likeness of sinful flesh” and in His flesh took on the condemnation of the law—the death penalty owed, though He was sinless—fulfilling “the just requirement of the law” so that we might live free from the just demand of the law and according to its merciful Spirit (Rom 8:1-4). The woman is left unharmed because Jesus takes on her condemnation and deserved death; representative of how Jesus has taken our place, sparing us from a hellish existence here, and for eternity, of being hurled with stones of guilt and shame by “the accuser of the brethren” (Rev 12:10)—Satan—if we trustingly accept God’s mercy in humble repentance, and despite our faults go our way trying to “sin no more”—a final word that guards against the opposite error of distrust in God’s mercy— presumption. Eventually everyone pitters away, the oldest first—representing souls mature in self-knowledge, who know their sinfulness all too well. Jesus then asks, “Woman, where are they? Has no one condemned you?” She replies, “No one, Lord.” Why ask a question Jesus knows the answer to? Because He wants her to say it, so that the truth might ring louder in her ears, and so that she is prepared to know that truly no one is condemning her—not even Jesus, not even the Lord for “there is therefore now no condemnation for those who are in Christ Jesus” (Rom 8:1). Our Lord wants every soul, every sinner to utter these words, “No one, Lord, no one. Not one can condemn me, not I, nor Satan, nor the world, for You have released me. No one, Lord, not even You, for You love me.” Sincerely spoken from the heart—these words are repentance and a contrition of love. Is it even possible to imagine tears were not streaming down this woman’s face as she replied, “No one, Lord”? And it is then that Jesus accepts the brokenness of her sorry heart and once again speaks as the Anointed One of God in whose mouth the Father has put His words: “Nor do I condemn you” (8:11). In the Aramaic tongue Jesus would have spoken, the Peshitta gives us the closet thing to the original: āphlā enā mechyev anā lēki. Five words. David held five stones in his pocket and hurled one at Goliath and killed him (1 Sam 17). Jesus stopped the onslaught of stones fated to destroy her in shame, and hurled instead five words that each flew like darts and penetrated her heart, killing the law of sin within, and jolting the law of grace. So deep the wound of love it stayed with her all her life, “Nor do I condemn you.” This was her Gospel—five words. 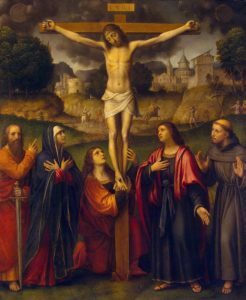 Five words which hurl themselves into our heart in the confessional through the words of absolution, and which are inscribed into the ground of our being again and again at the touch of God’s finger aflame with love that reaches from the Holy Host of Christ’s Body. She came wounded in sin to Jesus, and left wounded in love. 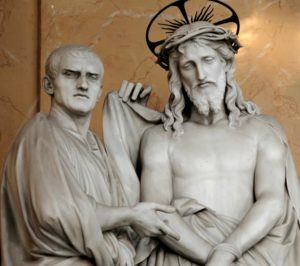 We come wounded as sinners to Jesus in Confession and in the Holy Eucharist, to receive and to adore, and leave wounded in love. “Go, from now on sin no more.” She came dirty and left cleansed; thirsty and left satiated. Forgiven on deaths door, she forgave all—her accusers too. Healed of sin she lived anew, and healed of sin we will too. Of old it was said, “Those who depart from me shall be written in the ground, because they have forsaken the Lord, the fountain of living waters” (Jer 17:13), but to her then, to us today—the Lord has spoken, “If any one thirsts, let him come to me” ‘for those who cling to me shall be written in the ground, because they have been embraced by the Lord, the fountain of living waters’ (see Jn 7:38). Note: Scripture passages taken from the RSV or else taken from the Hebrew, Greek or Aramaic text. Modified from the original which appeared in a booklet utilised for the 24 Hours for the Lord (2019) in the Parish of the Huon Valley, Archdiocese of Hobart, Australia. 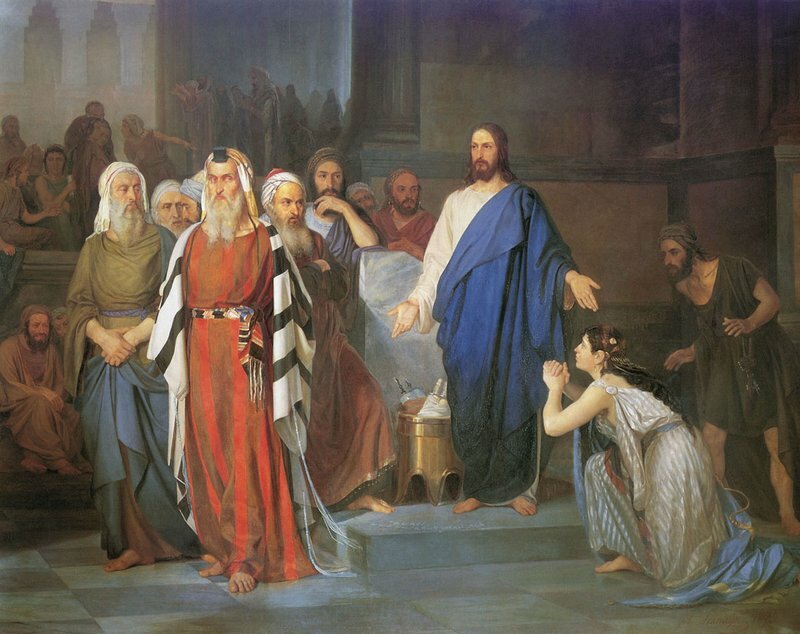 Painting: Isaak Asknaziy, Jesus and the adulteress (19th century)/PD-US. Reminds me of what is going on in American politics….sad. the reflection was very insightful. Another reflection pointed to the fact that Jesus forgives her, yes. Yet, he also admonishes her to ‘go and sin no more’. She’s not off the hook to do as she pleases just because the elders turned and walked away. Jesus always calls us to more; he calls us to him.